Fama, a social media screening technology company, recently announced a strategic partnership with Bishops Services, a Sterling Talent Solutions company and leader in investigation and corporate due diligence. 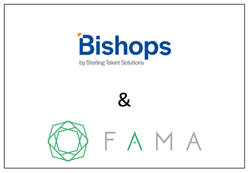 Fama, a social media screening technology company, recently announced a strategic partnership with Bishops Services, a Sterling Talent Solutions company and leader in investigation and corporate due diligence. The partnership is designed to provide a superior social media screening product to Bishops’ domestic and international due diligence client base. With the amount of information available online, many people consider social media screening a necessary part of a due diligence background investigation. Whether good or bad, a person’s online identity can provide insights into the values and behaviors of an individual and can be a deciding factor when choosing business partners or making investments decisions. "From the moment we met the team at Bishops, we knew this partnership was destined for success,” stated Fama CEO Ben Mones. “As a team, they recognize that the nature of due diligence investigations has evolved, especially as it pertains to the explosion of social media and web content over the past few years. We're thrilled to take our combined solution to market and help Bishops' clients stay one step ahead." Fama’s solution combs through an individual’s entire online identity and provides a clean, easy to digest report based upon criteria that has been customized to the client’s specific needs. When paired with Bishops’ full scope of investigative services, including compilation of civil lawsuits, criminal history and an individual’s overall reputation, the Fama screening will have even greater impact and relevance. Built by a team of PhD data scientists, engineers, and change makers, Fama is an AI-based solution that helps businesses make smarter hiring and management decisions by analyzing publicly available information and internal HR data. The fully customizable solution uses machine learning and natural language processing to analyze an individual’s public online and social media presence to locate only the relevant information while keeping out the noise. Bishops Services is the oldest privately held investigation and corporate due diligence firm in the United States. Founded in 1898, Bishops uses its decades of experience to bring insight, accuracy and timeliness to its investigations around the world. Our clients include financial institutions such as private equity, asset management and venture capital firms. Bishops also works with law firms, governments, and executive recruiting firms to minimize risk. Our lead investigators develop a deep understanding of the needs of each market segment and tailor their due diligence and reporting process to meet a client’s individual needs.